At this upscale spin-off of the East Village’s original Takahachi, you’ll need to pick and choose from the pun-filled, East-meets-West menu. 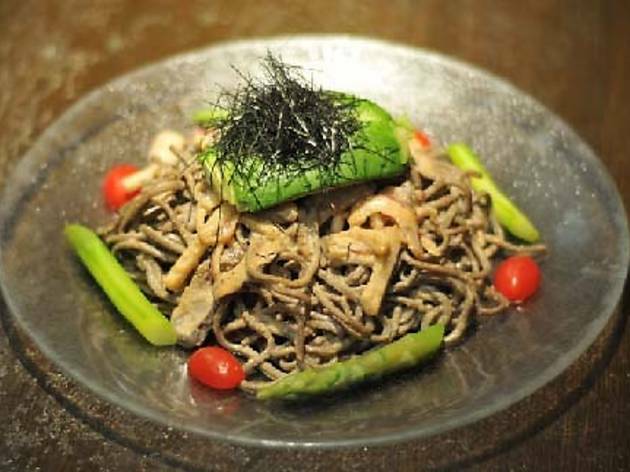 Chilled soba salad, for instance, is a pleasing pile of sesame-dressed buckwheat noodles served with shiitake and avocado. Barbecued eel, walnuts and tofu skin are Happy Together in a delicious roll. Sushi wasn’t as fresh or pristine as you might like it to be, so have the saikoro steak instead: chunks of marinated, grilled rib eye. In a nod to authenticity, the desserts include a green tea milk crepe served with custard cream.